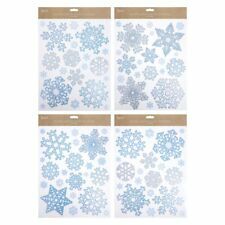 1,57x Self Clings white Christmas Snowflakes Windows Stickers. 4,Reusable: For Window and other high shine surfaces. 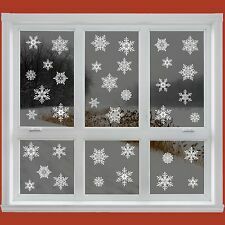 The snowflake clings are made from transparent self-cling static film, can be moved and repositioned as often as you like, easily taken down and reusable, they don't leave any marks on the glass, don't fell off the windows. I think these have been hand painted and are good quality. Easily taken down and reusable. peel them from the backing sheet. Once removed, save the backing sheet. and press them onto a window. Simply clean(wipe)the surface area. or any clean high shine surface. 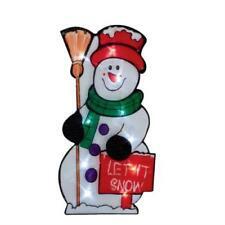 The snowflake clings are made from transparent self-cling static film, can be moved and repositioned as often as you like, easily taken down and reusable, they don't leave any markson the glass, don't fell off the windows. !!! Professionally HEMMED EDGES ready to hang !!! 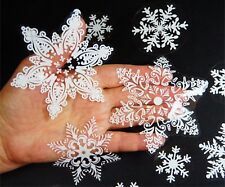 Reusable Christmas Snowflakes Window Stickers, These snowflakes have beautiful and elegant design. For window and other high shine surfaces. The snowflake clings are made from transparent self-cling static film, can be moved, easily taken down and reusable, they don't leave any marks on the glass, no glue. 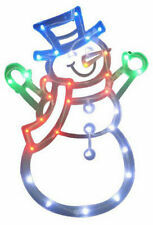 85 NICEXMAS Snowflake Window Clings Christmas Decoration 33 Different Snowflakes Glueless PVC Stickers. - The static window clings need no gummy adhesive or tape to stick them on and will not leave any marks. Descriptions:1.the package includes:3 x A4 sheet (9 different designs included)2.Size: 2 x 100 mm(diameter),3 x 60 mm, 4 x 40 mm, 10 x 35 mm3.Reusable Christmas Snowflakes Window Stickers,These snowflakes have beautiful and elegant design 4.For window and other high shine surfaces.The snowflake clings are made from transparent self-cling static film, can be moved, easily taken down and reusable, they don't leave any marks on the glass, no glue.5.Very easy to apply: Just peel them from the backing sheet, and press them onto a window or any clean high shine surface. Once removed, save the backing sheet and use them next year! Brand Unbr. Plastic snowman with sticky hands and feet that tumble down a window. News Letter. ENDING SOON. NEW ARRIVALS. ADD US TO YOUR FAVORITES. Fancy Dress. Party Supplies. Office Stationary. 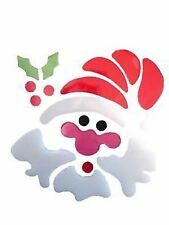 Beautiful full colour Happy Christmas Reindeer window cling sticker. Easy to apply AND reusable. Full instructions included. Made in the UK by Stickers4. This high quality, British-made window cling can be used again & again. 29 Snowflake & Stars. 29 Snowflakes & Stars. 12 x 32 mm. 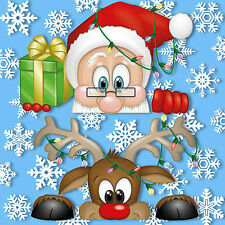 Beautiful full colour Christmas Reindeer window cling sticker. Easy to apply AND reusable. Full instructions included. Made in the UK by Stickers4. This high quality, British-made window cling can be used again & again. Here we have a beautifully handmade Christmas Advent Picture. Featuring little pegs numbered 1-24 on, there is a small toy hanging from each peg to represent the countdown to Christmas. Background consists of gold glitter paper and ribbon to the top and bottom. Quickly decorate your windows and make a beautiful Christmas display everybody will love. Simply peel the Santa and snowflakes off of the backing card and press on to your window. Your neighbours and friends will be impressed with your snowy display. Wall & Window Decorations. Stick well, it will stay in place and good shape. 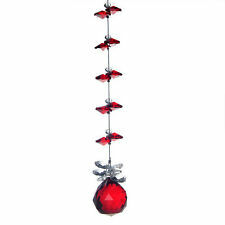 Perfect for Christmas decoration and add more festival atmosphere to your Christmas, making the event unforgettable! PARTY DECORATIONS . 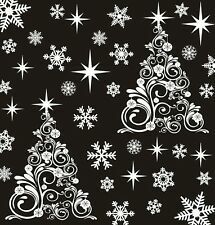 Each snowflake sheet has been printed with 14 different snowflake designs. You will receive 28 snowflake clings in total. Each snowflake has been cut-out (as close as possible) around the design. Quickly decorate your windows and make a beautiful Christmas display everybody will love. Bigger than Other Snowflakes Being Sold Please Compare! This Sticker is printed onto self cling material for ease of. 2 x Christmas Trees with 48 snowflakes. 18 x 20 mm. 48 snowflakes. We are back for the 10th year running. 12 x 37 mm. Quickly decorate your windows and make a beautiful Christmas display everybody will love. They have been printed using the latest techniques so they can be seen clearly from both sides of the window. DISNEY 7" x 5.25" STAR WARS GEL CLING Holiday/Christmas YODA W/CANDY CANE New! Get into the festive spirit this year with some Christmas window decorations for your home. You'll find loads of great decorations, from Christmas window stickers and decals to windowsill decorations that will get your home looking festive in no time. No matter what your decor style, you're sure to find some Christmassy window stickers to match. Many of these stickers are even multi-use, so you can pack them away in January ready to be used next Christmas. For a bright and colourful effect, try some multi-coloured bauble stickers to place on your windows for a beautiful stained glass effect. Or, if you're a fan of modern and minimalist designs, keep it simple by going for some cute white snowflakes to adorn your windows. To really spread the Christmas cheer this December, pick up window stickers spelling out phrases like "Merry Christmas" to place on your windows for neighbours and passersby to read. You can also pick up some children's Christmas window stickers for your kids to stick on their windows to get them even more excited for Christmas Day. Choose all their favourite characters like Frosty the Snowman, Rudolph the Reindeer and, of course, Father Christmas himself. As well as stickers, you can also pick up some windowsill decorations like cosy candle bridges. Many of these traditional decorations come with battery-powered candles, which are ideal if you have little ones running around. Go for ornate candle bridges for a really eye-catching Christmas decoration, or go contemporary with sleek and modern designs. You could even pick up some Christmassy net curtains to decorate your windows this year. Choose pretty white curtains with snowflake or mistletoe details, or go for some bright red curtains to really get your windows looking their festive best this winter.